Buy 10 oz Ace of Hearts Silver Bars exclusively at Kitco. These unique genuine 10 oz silver bullion bars are struck with a gorgeous interpretation of the Ace of Hearts. Our 10 oz Silver Bar Ace of Hearts is definitely not just another generic 10 oz silver bar. This 10 oz Ace of Hearts Silver Bars from Kitco is an exclusive item for the silver bullion bar lover who is looking for a truly unique item to own and to give. The Kitco 10 oz Silver Bar Ace of Hearts is a collectible silver bullion work of art. It contains 10 oz of .999 fine silver bullion and is minted exclusively for Kitco by SMI (Sunshine Mint Inc. of the USA). This beautiful 10 oz Silver Bar Ace of Hearts design comes encapsulated in protective acrylic casing with a stylish black and gold sleeve wrap reminiscent of a box of playing cards. Playing cards have existed for centuries, and the Ace of Hearts is one type of the four aces from a standard 52 playing card deck. The detailed design and limited quantity production makes Kitco's exclusive 10 oz Silver Bar Ace of Hearts a great addition to your silver collection. It is a unique and valuable gift for the card lover or poker player on your list. The Ace of Hearts is 1 of 4 designs available in this 10 oz Silver Bar Poker Series. Limited quantities of these unique 10 oz Silver Bars have been designed and minted in each of the 4 different suits (Hearts, Diamonds, Clubs and Spades). The four designs are available as a set of 4 Silver Bars, sold in an elegant wood gift box. They may also be purchased individually on our silver bullion bar page. Buy your 10 oz Silver Bar Ace of Hearts from Kitco today. Founded in 1979, Sunshine Minting Inc. (known in short amongst silver bullion aficionados as SMI) is a full service silver bullion minting facility that is well known to help redefine global standards and respected in the industry as a leader. The Sunshine Mint specializes in producing silver bullion rounds and silver bullion bars. Sunshine Minting Inc. is also a major supplier of blank silver planchets to the US Mint used to strike American Silver Eagle Coins. Despite the fact that Sunshine is a North American mint located in the USA, their silver bullion products have gained popularity and demand from all over the world. Kitco is a trusted leader in the silver bar and physical precious metals industry. 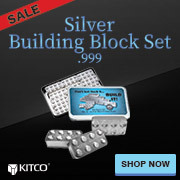 Silver bullion bars and other precious metals sold by Kitco are recognized in silver bullion markets around the world. With our focus on silver bars, you can benefit from our low silver bar prices and premiums that are highly competitive in the industry. At Kitco, we make it easy for you to manage your tangible wealth.